Salinity and water stress limit crop productivity worldwide and generate substantial economic losses each year, yet innovative research on crop and natural resource management can reveal cost-effective ways in which farmers can increase both their productivity and their income. 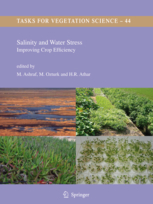 Presenting recent research findings on salt stress, water stress and stress-adapted plants, this book offers insights into new strategies for increasing the efficiency of crops under stressful environments. The strategies are based on conventional breeding and advanced molecular techniques used by plant physiologists, and are discussed using specific case studies to illustrate their potential. The book emphasizes the effects of environmental factors on specific stages of plant development, and discusses the role of plant growth regulators, nutrients, osmoprotectants and antioxidants in counteracting their adverse affects. Synthesising updated information on mechansisms of stress tolerance at cell, tissue and whole-plant level, this book provides a useful reference text for post graduate students and researchers involved in the fields of stress physiology and plant physiology in general, with additional readership amongst researchers in horticulture, agronomy, crop science, conservation, environmental management and ecological restoration.